This blog concerns itself with the messy, multidisciplinary spaces of the archives—both real and imagined. It brings together everyone involved in the creation of archives to discuss how these spaces shape, have shaped, and will shape the study of modernism. What Is a Modernist Archive? Fig. 1. 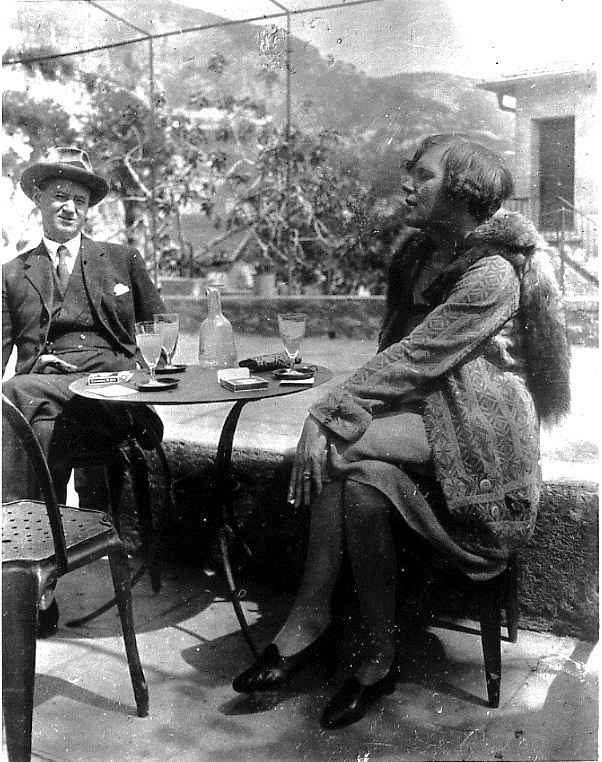 Mary Butts and Douglas Goldring sharing a drink on the Continent, 1920s. Photographs of Mary Butts © 1998 by The Estate of Mary Butts; published by permission. 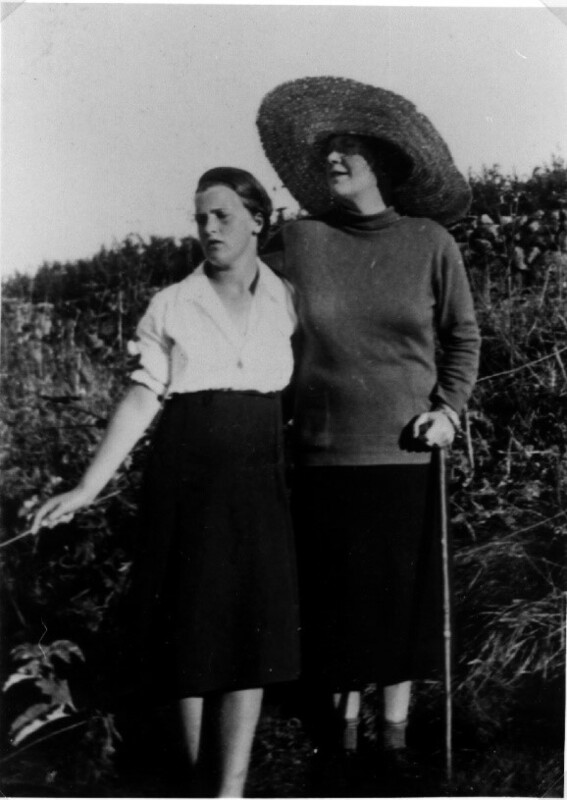 Located in Special Collections at the University of Victoria is a little studied folder that contains fifty-one letters written by the British modernist author Mary Butts (1890-1937) to friend and fellow British modernist Douglas Goldring (1887-1960), with some few to Goldring’s second wife, Malin. Butts was part of the expat artistic community that partied and wrote in Paris and along the French Riviera during the 1920s. She wrote her modernist masterpiece, the novel Armed with Madness (1928), on the Riviera and picked up her opium habit there, under the influence of Jean Cocteau. Many of Butts’s letters were sent to Goldring from the Riviera and various other locations across Europe, but many more were sent from the remote location of Sennen Cove, Cornwall—a beautiful and rugged stretch of English coast. Butts returned to England in 1930 after suffering a breakdown in Paris, relocating to Sennen from 1932 until her untimely death in 1937. Sennen became Butts’s retreat from the world. 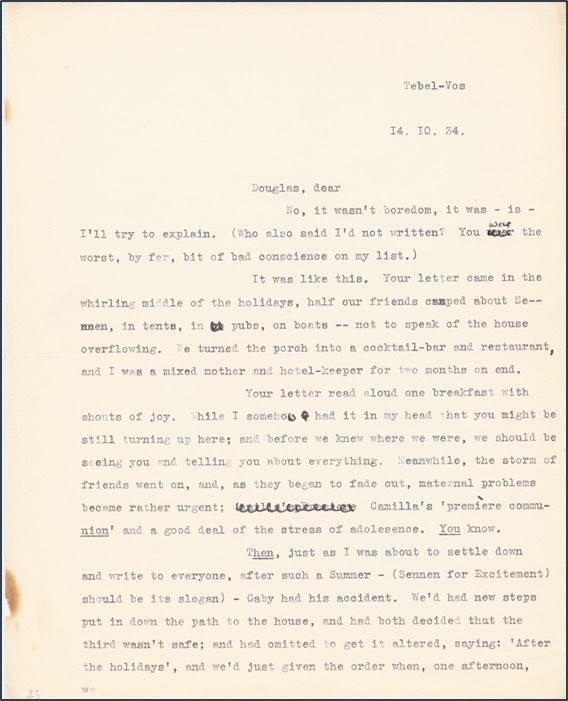 Many of the letters to Goldring bear the Sennen address, as well as the name Butts bestowed on her bungalow: Tebel Vos, the Cornish for “House of Magic.” The location witnessed her most productive years as a writer, with Butts completing three novels and her autobiography of childhood, alongside numerous short stories and review articles. As a scholar of Butts’s work, I am interested in what the letters might reveal about their author, her work, and the transnational communities within which Butts moved. All of Butts’s letters (gathered from around the world) will eventually be assembled into an edition to be published by McPherson & Co, who continue to reissue Butts’s work, helping to reclaim this leesser-known modernist. But as I began what I’m now calling the Mary Butts Letters Project this past year, I started to consider not only the content of the letters but the archive: a location, depository, holding, with various “comings and goings,” though all of them very well-regulated. As I read and reimagined the letters and archive through the lens of spatial theory and embodied practice, I couldn’t help but think of the letters whizzing across Europe in the 1920s and 1930s, and of Butts’s final isolated retreat in Cornwall—a great distance from an archive in British Columbia. The letters connected these very different geographical and cultural spaces, yet seemed somehow trapped, both physically and in terms of meaning, in their final resting place. Would burning them, à la F. T. Marinetti’s manifesto, free them? Rather than, then, discussing here what I found in the archive, I want to get out of the archive and back to the site of creation (in the absence of a site of “publication” that—as Matt Huculak discusses— George Bornstein suggests we look to for an embodied, material, reading of modernist literary production). I want to consider the movement of letters and movement around the letters that connects their final depository and their place of origin. 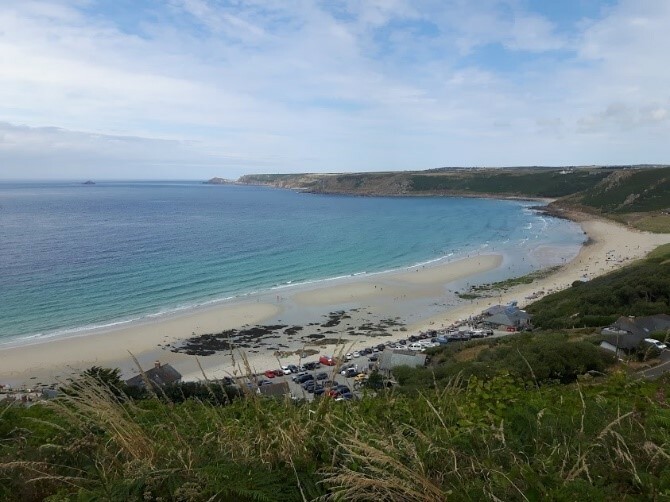 After transcribing the fifty-one letters at the beginning of 2018, I decided to take a summer holiday in Cornwall and visit Sennen Cove. As academics, we often insert ourselves into the archive we study, leaving subtle (and sometimes not so subtle) marks alongside the materials we “discover”: notes, catalogues— sometimes more blatant insertions of the self, disrupting the archive material’s rest. And though we can’t wander out and off with materials held within its confines, the publication of findings from archival studies in a sense has such an effect, “moving” materials into the outside world. The interaction of academic with archive is certainly—somewhat paradoxically given the carefully curated nature of the space and its holdings—one of movement(s); I like to think of it as a kind of dance. I was thinking on a dance of letters, as I climbed the cliff up from the sea to reach Butts’s bungalow. In Butts’s time, local fishermen still used seine nets—an old method that just about survived into the 1930s, here at least. One of the men, the Hueur, stood on the hillside, at times energetically gesticulating, guiding the men in boats towards the shoals he could see moving in the water below. Having walked the cliff top for days looking for the expected arrival of bass or pollock, he finally danced the men to their catch. Butts writes about them in her essay “The Seine Net: Community Fishing in Cornwall,” reading the dance as a kind of magic, a survival in the modern world. Figs. 2–3, Sennen Cove and surrounding landscape. Photograph by the author. Here, at Sennen, in the summer of 2018, the letters had danced me back to their place of origin, from their place of final rest. From Butts’s bungalow, you can see, smell, and hear the sea crashing below. You can touch the long grasses and gorse that define the cliffs; glimpse the long white sands that stretch out of Sennen Cove further up the coast, and the few scattered houses and the dominant cliffs, along which snakes the thin line of a coastal path that takes you to St. Just, then Zennor, then St. Ives. Despite a few new buildings and a few modifications— dormer windows on Tebel Vos, now renamed Namaste— little seems to have changed here. At the risk of romanticising, or paraphrasing Butts’s essay on the wonder and devastation of an Atlantic storm, Sennen Cove remains a mostly isolated watery, earthy location, set to a musical accompaniment of wind and sea. Butts’s Sennen letters to Goldring might have remained in UVic Special Collections, but the transcriptions had at least journeyed with me to Cornwall on my laptop, and they still seemed to be an apt evocation of place. Fig. 4. 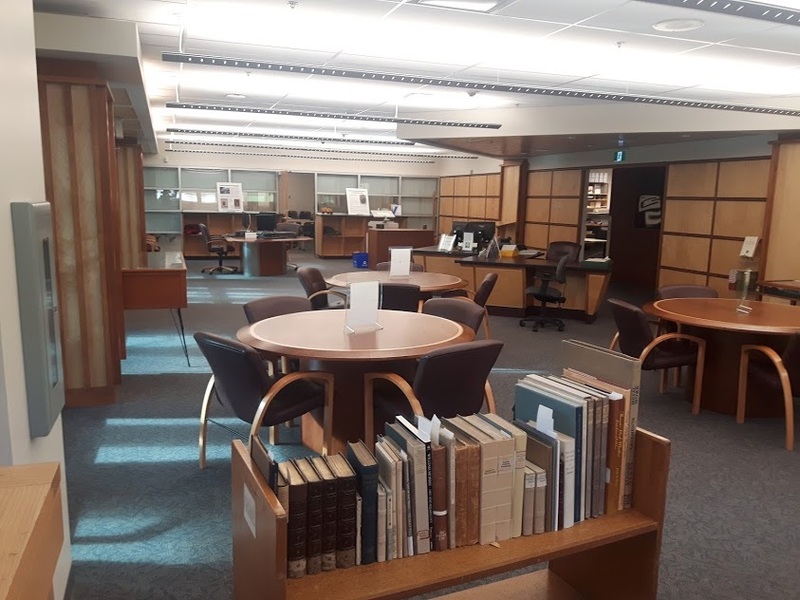 Special Collections, McPherson Library, University of Victoria. Photograph by the author. Fig. 5. 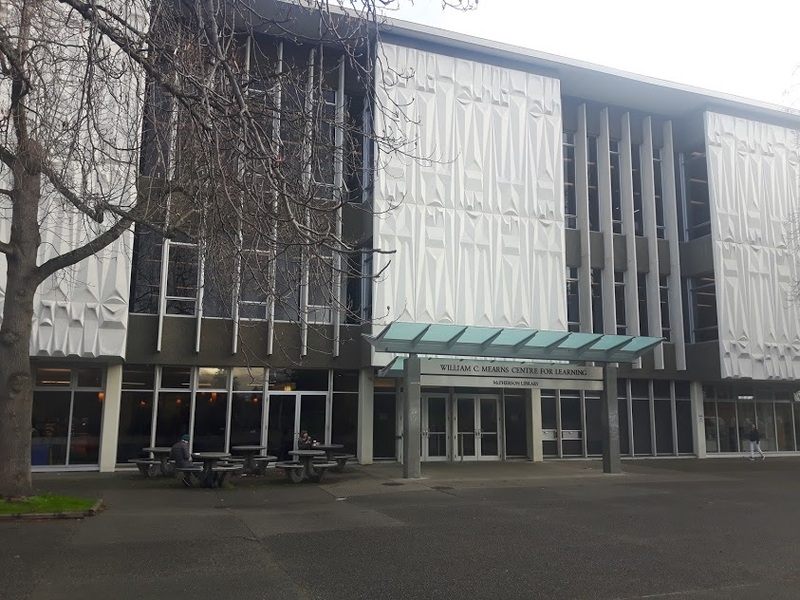 McPherson Library, University of Victoria. Photograph by the author. Fig. 6. Mary Butts’s Sennen bungalow, today. Photograph by the author. Butts doesn’t write of fishing in her Sennen letters to Goldring, but Sennen manifests on the pages in many other forms. The letters describe and give direction to her new home, planning visits from her friend and family, gossiping about local residents, which included the author Ruth Manning-Sanders, and notes about the weather. 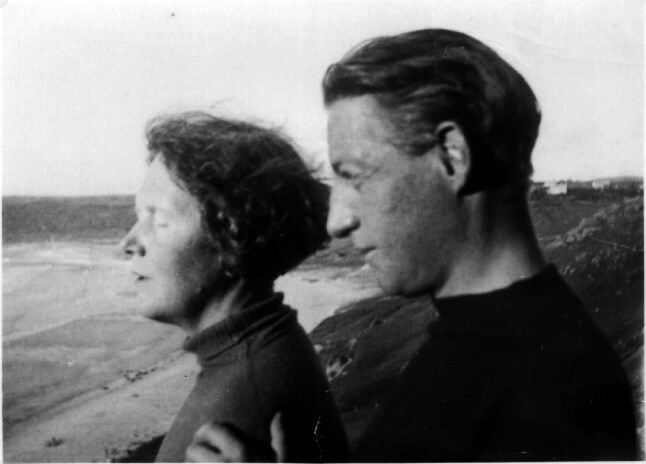 Goldring’s son, Hugh, would sometimes stay by himself with Butts and her second husband, the painter Gabriel Aitkin (they married in 1930, but the marriage did not last long; Aitkin had left permanently for his native Newcastle by 1934). Butts’s daughter, Camilla Rodker (from her first marriage to writer John Rodker), who was for the most part raised by her aunt, also stayed on occasion. Fig. 7. Mary Butts and Gabriel Aikin; the view from Tebel Vos. Photographs of Mary Butts © 1998 by The Estate of Mary Butts; published by permission. Fig. 8. Mary Butts and daughter Camilla Rodker; Sennen Cove. Photographs of Mary Butts © 1998 by The Estate of Mary Butts; published by permission. Fig. 9. 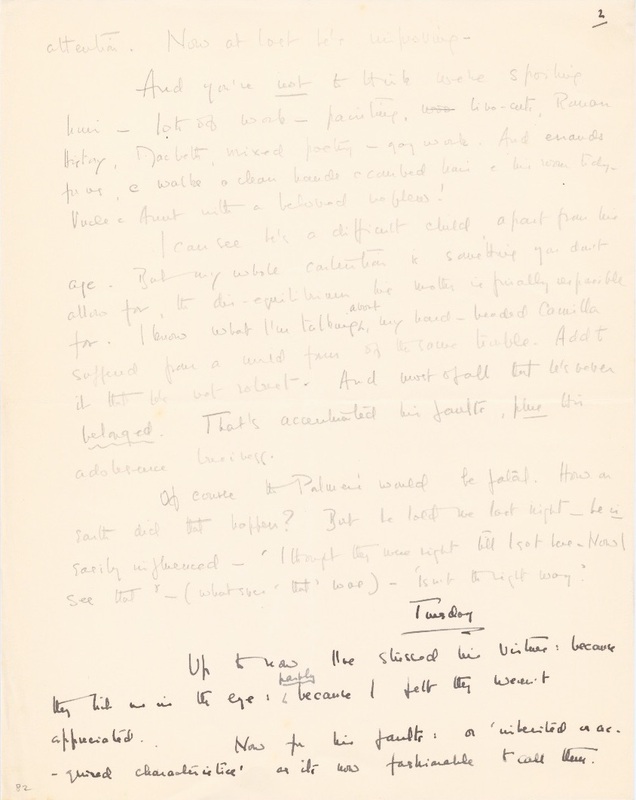 Mary Butts, letter to Douglas Goldring, 14 Oct 1935, page 1/3: Summer holiday party. Courtesy of the University of Victoria Libraries Special Collections and Archives. In this house, perched on an eyebrow of bushy, flowery cliff, three hundred feet above the Atlantic, one watched its awful play. 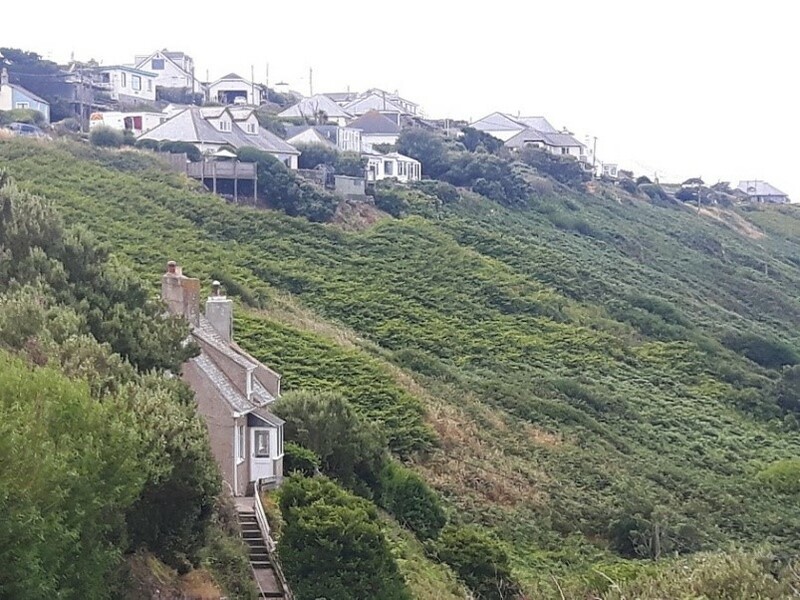 The reader finds the effects of the Sennen landscape and sea in Butts’s fiction but also central to her journals, as walks along the cliffs, writing and gardening structure her days. Arguably, not to have seen the landscape, the point of creation of her letters (or indeed other works written in Sennen), is to lose understanding of the letters housed in the archive. The materiality of the letters likewise tells us of Sennen’s influence. Paper used by Butts is diverse, and while some is of high quality, other pages seemingly come from a notebook: lack of funds and isolatated location perhaps dictate this. She begins one letter in pencil, explaining that she has run out of ink and that Goldring’s son, Hugh, who is staying with her, has gone out for some. We presume his quest is a success because the letter is continued the next day in ink (fig. 10). Fig. 10. Mary Butts, letter to Douglas Goldring, Sennen, Tuesday, page 2/4: Ink has arrived. Courtesy of the University of Victoria Libraries Special Collections and Archives. To not have seen Sennen is to lose something of this quest for ink. 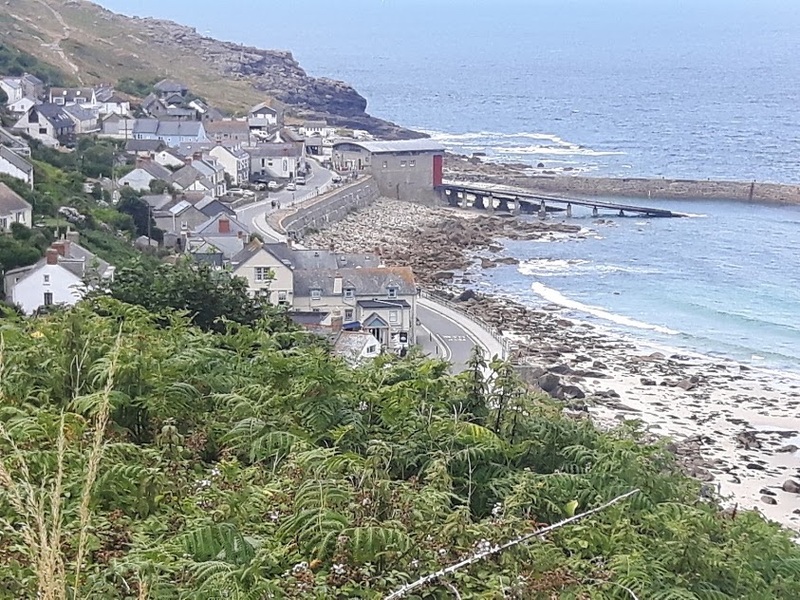 If Hugh has gone out for ink, he is in for quite a climb, further up the cliff, across a field or two into Sennen village itself, which even today offers limited wares for sale. If no ink is found there, then one must travel to a neighbouring village, some distance on foot. Sennen impacts the materiality of the letters and their content, urging us to consider the location of composition in our study of them. The walks, the cliffs, the surrounding landscape are made present in Butts’s letters. We need to get out of the archive, though, to appreciate this. The archive, if we follow Zygmunt Bauman’s diagnoses of modernity, is the most modern of locations and acts. Bauman reads modernity as an “age of artificial order,” and “grand societal designs,” governed by a conscious endeavour to remove all “ambivalence” from our experience of life. This drive to order, name and control all things is, though, according to Bauman responsible for creating greater ambiguity—fragmenting and destabilizing, creating complexities that drive ever more futile attempts at creating order. There is, of course, wonder and knowledge in this ever-increasing complexity. The archive arguably oversees such a will to order, but I like to think it creates a little chaos in the process. To put this in more spatial terms, we might imagine the archive as a assemblage, à la Gilles Deleuze and Felix Guattari, in which material and immaterial processes create complex connections in the formation of a territory—a territory of knowledge and of regulated university space, among other things. But the exciting part of Deleuze and Guattari’s vision of the assemblage is the inherent process of deterritorialization that takes place even as a territory is established. This is enabled through what Deleuze and Guattari call “lines of flight” – those “movements” unplanned, paradoxical and, surprising. Lines of flight spring through Butts’s work destabilizing her vision of a tightly controlled bucolic Wessex, agitating otherwise still, painting-like scenes. Critics have so far said little about the deliberate or accidental (a failing on Butts’s part?) destabilizing of these boundaries, too intent on defining the borders she erects on the page. Butts, though, seems aware of the “assemblage,” which like the processes of nature that saturate her work, is caught in her phrase, repeated in a few of her works: a space “forever moving, forever at rest.” Her works are not just modern; they also anticipate the order of the archive. In her journals, she ponders what might become of her writing after her death. Who might read it? Where might it be stored? At times, she writes her journal with this future reader in mind—a dancer on a far-off cliff. Could then some of the letters be read the same way—Butts at work, readying her own modernist archive? Is the “modernist archive” a process of modernity? Absolutely. But then it might also offer an escape from modernity as well. “Lines of flight” pierce the territory of the scholar, an archive “forever moving, forever at rest.” We need to get out of the archive, in order to take something back in. Mary Butts, “The Seine Net: Community Fishing in Cornwall,” Manchester Guardian 8 March 1935, 9. See Mary Butts, “Spring Storm,” Manchester Guardian, 11 June 1935, 16. Mary Butts, Letter to Douglas Goldring, 14 October 1934. Box 1, Folder 19, SC048 Douglas Goldring fonds. Special Collections University of Victoria, British Columbia, Canada. Letters published with permission from the Estate of Mary Butts. Mary Butts, Armed with Madness, in The Taverner Novels, Kingston, NY: McPherson & Company, 1992, 92.